Hey guys, Ive been playing around for a week with nethserver and its been an enjoyable ride. 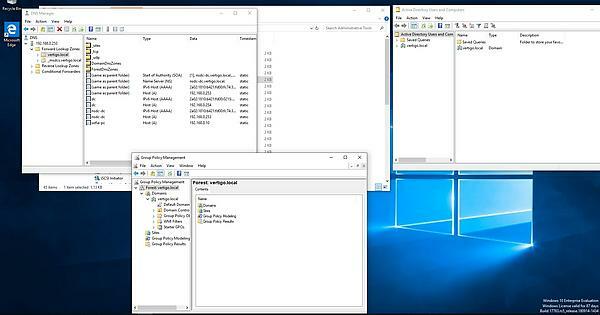 ve been using an hyper v enviroment to build my test lab. 2 - Edit company info and certificate <- Very important: was stuck here. If you dont edit those fields you will deploy a DC with errors. Can you ping 192.168.1.253 from a client? Can ping 192.168.1.253 from client. Spoofing was on. Tried a new machine following the same steps and it worked. Cant really tell why it wasnt working yesterday. I will leave a print screen from the RSAT tool on a windows 10 machine. Is this still a testing environment? I ask because AFAIK best practices for a naming convention for your internal domain, when you also have an external domain is using a subdomain of the external domain you have registered. Be aware that due to restrictions in NETBIOS, a servername can’t have more than 15 characters. And since the Samba4 container is always prefixed with NSDC- the NethServer servername can’t have more than 10 characters. Your approach is an alternative and as you mention, it needs you to add a 2nd dns zone. btw… NethServer defaults to “ad” as subdomain, but you can choose any name you want.